Niagara County, N.Y. - On July 26th and 27th the Niagara Wine Trail will hold their 6th annual Wine & Culinary Festival in Academy Park, located in the heart of the Village of Lewiston on Center Street. The wine festival has previously drawn thousands of wine lovers over the last five years to Lewiston seeking to enjoy wines from the Niagara Wine Trail USA wineries, and cuisine from local restaurants and vendors. The Wine & Culinary Festival runs Saturday from 12pm - 7pm and Sunday from 12pm - 6pm. The opportunity to purchase bottles of wine and cider from the wineries will be available, along with a convenient wine pick-up service, which allows attendees to make purchases and pick them up as they exist the festival so their hands are free to taste and enjoy the culinary delights. Previous festivals have featured both live demonstrations and wine education seminars on both event days. This year the festival organizers have included other fun and interactive activities under the main tent including a wine trivia game. Advance tickets for are available for purchase through the festival website for $25 plus tax until July 25th at 9pm. Tickets include a souvenir wine glass (while they last) upon check-in which may be used both days, and a taste wine tasting pass valid for one tasting of three wines at each participating winery both days of the festival. Advance online ticket sales will also receive $5 in coupons valid for $1 off a wine bottle purchase made during the festival (one coupon per purchase, per winery). Tickets are available during the festival at the gate for $30 each. Both advance and tickets purchased at the festival are valid for both days. 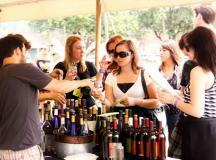 Attendees are encouraged to spread out their wine tastings over the two days. Festival tickets do not include food, which may be purchased directly from the local vendors. The ticket holder is responsible to retain their ticket and tasting glass. Attendees are required to show ID to receive a new wristband for each day of tasting.There is no charge for designated drivers or attendees that do not participate in the wine tasting. A complete list of wineries, vendors and a schedule of the seminars can be found on the festival website: www.niagarawineandculinaryfestival.com.